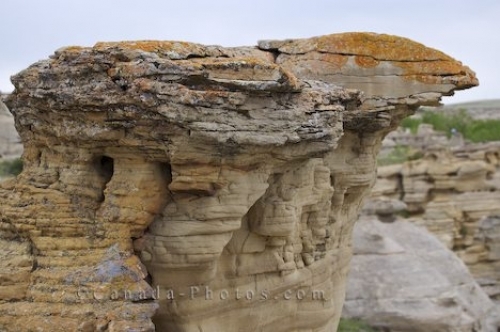 A close up picture of a hoodoo that is a unique rock formation found along the Hoodoos Interpretative Trail in Writing on Stone Provincial Park in Southern Alberta, Canada. This fascinating rock formation known as a Hoodoo has been created over 15,000 years and is made up of sandstone layers with a top that is called a caprock. The tops protect the sandstone layers from eroding away. As you venture along the Hoodoo Interpretive Trail in Writing on Stone Provincial Park in Southern Alberta, Canada you will find a landscape full of hoodoos. Picture of a Hoodoo along the Interpretative Trail in Writing on Stone Provincial Park in Southern Alberta, Canada.